What's that tune I'm hearing everywhere? What's that sound a floating in the air? What's that music all the brass bands play? Hear it in the morning every night and day. 'Taint like music Mister Wagner wrote, Got a funny, sneaky minor note, if you ask what they are playing, Everybody will be saying, "It's another rag, that's all"
That's some tune, it's got some feeling too You don't know just what has happened to you. Starts you jumping like a big jumping Jack sending chills a running up and down your back It's a lovey dovery sort of a strain Make you do things that you can't explain When the violins are scraping, Then you'll know there's no escaping, From another raggy rag. Another rag, another raggy rag, Another tune to set you spoony soon, Another crazy tune, another lazy tune, It's a slippy, dippy, creepy, sleepy "get you going rag, Another strain, another raggy strain, A hum and buzz just like a Pullman train stop! (stop) look! (look) Come on and listen, That's it! (That's that) Don't you know what that is? 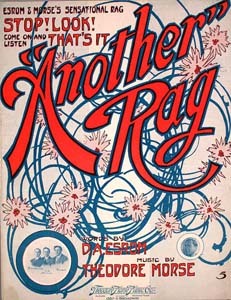 Why, that's another rag,a raggy rag.